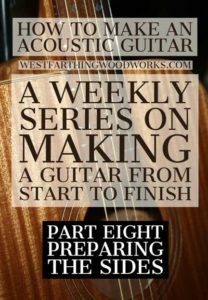 This week on How to Make an Acoustic Guitar – Part Eight, I’ll show you how to mill your sides, and prepare them for bending. There are some tricks along the way that make the process easier, and I’ll show those too. Enjoy. Most people think about the sides in terms of bending them. While this is an important part of making an acoustic guitar, preparing the sides is just as important. A set of well prepared sides will work far better, and be much easier too. This means easier bending, and easier trimming. A set of sides needs to be at the right thickness for the species, and the edges need to be trimmed well. This will make bending easier, and will also make gluing the body together easier. The more you can do in this prep stage the better. Don’t skip through and decide to do the trim work later on. This is the easiest time, and the best time. When the wood is flat and separated you can do far more than when its glued and bent. 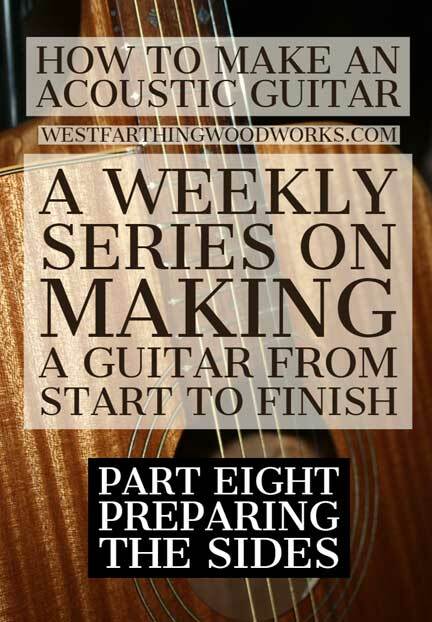 Here is everything you need to do to create a set of sides that will be perfect for your guitar. Follow along, and use the measurements from the book or plans you are following. 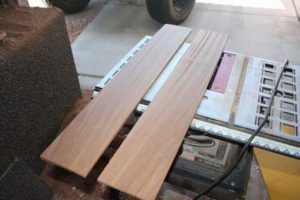 You can easily mill a set of sides from a piece of wood that is 4/4 thickness, which is the most common size you will find in a hardwood store. Since both pieces are less than 1/8 inch thick, this common board thickness will easily give up two pieces. Select your board at the same time you select your top and back. This is important, because you need to have the pieces match. If you select them at different times, you might not have the best matching set. The easiest way to do this is to get them from one board. That’s how this guitar was made, and that guaranteed the perfect match. Since the pieces were only inches from each other the entire time the tree was alive, they are a great match. Now, mill the board to about 5 inches by about 36 inches. Change these dimensions based on your plans as needed, but this is typically enough to make a good set. Square the edges and the ends now if you can, and then head to the table saw. 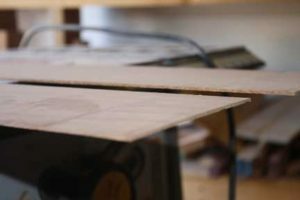 Split the board open through the center of the long edges, making two boards that are the same length and width, but half the thickness. Open these like a book, because you will need to book match them like the top and back when you bend them. The way to do this is to cut through the edge making a few passes. Each time, raise the blade a little more until you reach full height. At that point, flip the board so that the other edge faces down. Keep the same face against the fence, and saw the pieces free. The next step is to plane the boards to thickness. 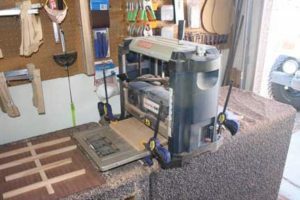 This is a pretty easy operation with a machine planer, and that’s what I recommend. It’s easier, faster, and in many cases cheaper than a hand plane. You can get a hand plane for less, but if you buy a good hand plane, and all the sharpening equipment, you can spend nearly the same amount of money. Also, you will need to learn to plane by hand, which is not an easy task. 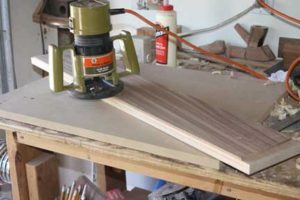 For all the practice you will need, the cost of a nice hand plane, the cost of good sharpening equipment, and the time it will take to learn to use it, you might as well just buy a machine planer. You will have a much easier time, and in the end it will be less expensive. 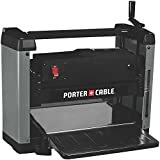 This is a really good thickness planer for a good price. I have never hand planed any of my tops, backs, or sides. 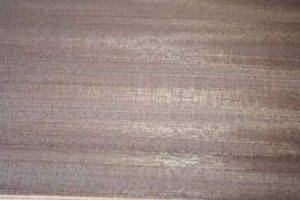 The machine does a far better job, and for less than the cost of the hand planing equipment. It’s even, smooth, and reliable every single time. You can find a good thickness planer for a few hundred dollars, and if you take care of it, you can get a very long life from the tool. Mine has been in my shop for over a decade, and it’s still as good as the day I bought it. The first step in planing the sides to thickness is to flatten the center faces of the boards on the planer. Since these faces were next to each other in the board, these are the closes to a mirror match. For this reason, the goal is to flatten those faces with the planer, and then stop removing wood from that side of the piece. Once the faces are flat, and the tool marks are all gone, flip the pieces over and remove the rest of the material from the other side. As you plane, watch the grain direction, and see which feed direction works better. In just about every case, one direction will work better than another. Figure that out right away, and then keep feeding from the better of the two directions. Finally, use a riser board inside the planer. Most planers will only go down to about 1/4 inch, which is too thick for sides. Add a 3/4 inch piece of MDF or melamine and clamp it to the in-feed and out-feed. 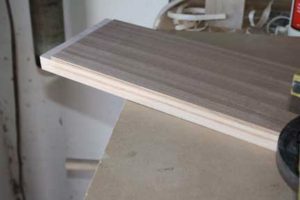 This effectively raises the bed of the planer, and now you can plane your boards as thin as you like. The height of the board eliminates the limitation on how thin the planer can cut, and you can make very thin plates. Follow your plans for the final thickness that you need, but in most cases something under 0.125″ or 1/8 inch is the best. Anything above that will be hard to bend, and anything too far below 0.090 inches will be too thin and brittle. Stop often and check your work. You should see that the pieces are thinning really well, and that you are not pulling out chunks from the boards. If you are, then you need to look at a few things. One feed direction will be better than the other. Try both and see which one feeds the easiest, and continue going in the direction. Take very thin passes on the planer. The deeper you go, the more you risk the planer accidentally eating the entire piece and only chunks coming out the other end. Use a riser board so you can make your pieces as thin as you want without limitation. Near the end, take passes so thin you barely see anything coming out. Feed both pieces through during each thickness adjustment. This way, you get both pieces to the same size before moving on to the next step. 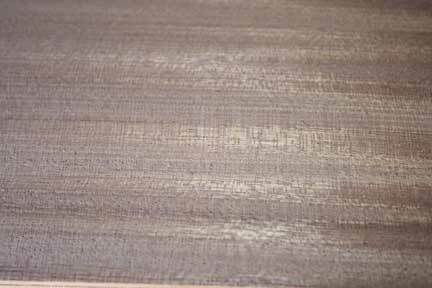 After you finish thickness planing your acoustic guitar sides, you need to take a look at them and address any issues that you find. If you did the job well, and took your time, you should have nothing to worry about. However, if you have gouges, grain pull, and other defects, you will need to address them or maybe even mill another set of sides. The beauty of making the sides yourself is the very low cost. You can afford to learn a little about your planer and scrap a set or two. Align your sides in a book match, and check the look. The two pieces should be a dead match, since they were so close to each other in the tree. Keep them aligned like this, and book fold them for trimming in the next step. If you jointed the boards before you thinned them on the planer, you might not need to do anything at this point. 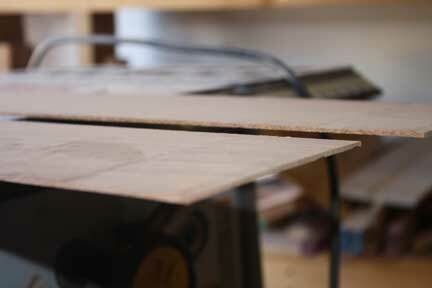 However, some boards have a little tension in them, and they can bend a bit after being thinned. If that is the case, you will have to joint the edges again. This is easy if you have a jointer, but not as easy if you don’t. That’s ok though, if you have a router, then you can joint your edges just as well. All you need is a board that has a flat edge, and a flush trimming bit. Arrange the boards like in the picture and clamp them all down. Keep the clamps away from the path of the router of course. Then, trim the overhanging edges flush to the board. At this point, both edges are flat, and these will become the edges that go in the mold on the bottom. 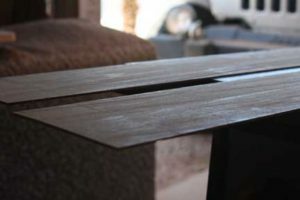 The bottom is where the top plate attaches, and this is a flat attachment, so the sides will fit perfectly without any additional planing to flatten them after bending. This simple step makes the bending and joining stages later much easier. Don’t skip it now and think you will do it later. Once the pieces are bent, it’s much harder, and you will have a much more difficult time. At this point you have a nice looking set of sides that are ready to be bent. Your pieces are a mirror match of each other, and the edges that need to be flat are flat. The other edges are not as important to flatten, because they are going to be planed on a taper later anyway. Guitar backs taper from the waist to the shoulders. Since this is done later with a hand plane, you do not need to spend time flattening something that you will be carving away anyway. Now that the sides are prepared, it’s time to bend them. This is a part of the process that is exhilarating for some people, and terrifying for others. Honestly, it’s right down the middle in most cases, and not as big as you think. It’s fun to bend wood, and not nearly as scary after you do it a few times. I’ll show you a consequence free way to bend sides first, as well as all of the equipment, and the techniques. Once you bend a few pieces, and get the feeling for it, you will be a pro. It’s just like any other operation in woodworking, and practice makes perfect. I’ll show you everything you need, and it will be a fun read. If you have any questions about preparing the sides, please leave a comment and I will be glad to answer them. Happy building.